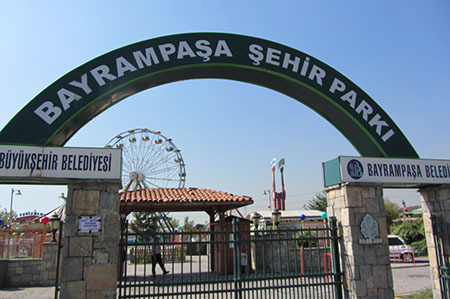 A short drive from Landora on the list was Bayrampasa, a large city park atop one of the many hills in the city. On arriving here it was obvious that security was tighter than at anywhere else I'd been to although I do not know the reasons why. My driver explained that I was here to check out the theme park and I was ushered to the managers office where I tried to explain what I was up to. Clearly not doing a good job I was told quite clearly that I wasn't allowed to take any photos. So leaving the park I told the driver to stop at another entrance, I then ran in (leaving the camera behind to not cause offence to him) and checked out the rides, which consisted of a small circle of around half a dozen rides including a tiny coaster called "Take Off", which would be a great name for a coaster that rises higher than the 4ft this one did.